Begin standing with your feet hip width apart. 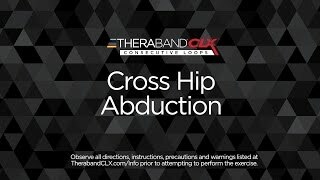 Cross the CLX to form an X feeding the ends of the CLX behind your knees. Before you pull the CLX around the outside of your knees anchor your hands in the end easy grip loops. Stand up and pull the CLX around the outside of your hips and cross your hands in front of your waist. With a slight bend in your knees, while maintaining your balance, kick one straight leg out to the side, bring your foot to the ground and then kick the opposite leg. Tip: Keep your trunk upright and your back in a neutral position. Don't lean your hips or trunk to either side.